SBI Cards, a joint venture between the country's largest lender SBI and GE Capital, launched credit cards with EMV chip securityfeature, which will provide enhanced security features to customers. "The launch of the EMV chip based cards for over 85 per cent of our new cards will help our customer with greater security features and also help us launch more relevant offers for our customers,"SBI Cards CEO Kadambi Narahari said. EMV or 'Euro Pay, MasterCard & Visa' is an industry standard, which prevents fraudulent usage due to possible cloning of credit cards, thereby, providing customers with enhanced security, SBI Cards said in a statement. Credit card cloning is a technique where someone obtains credit card details, copies them onto a bogus card and begins using the fake credit card. 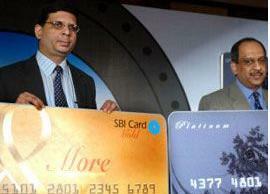 "We will move to EMV for 100 per cent of all new customers and cards within a few weeks," Narahari added. State Bank of India and international financial services provider GE Capital have set up two joint venture companies to develop a credit card business in India. While SBI Cards and Payment Services focuses on marketing and distribution of SBI Cards, GE Capital Business Processes Management Services handles the technology and processing needs of SBI Cards. SBI card services are raising to difficult and disgusting heights when it comes to basic services like issuing a new card on expiry to customer. A customer has to beg for a card which is so uncompetitive in todays global world. With this kind of track record, how long can SBI cards sustain in the market.